In 1979 the WA Mini Bike Club became incorporated and changed its name to the West Australian Junior Motocross Club inc. Around this time the club gained permission from the City of Gosnells to use some land adjacent to the Kelvin Road rubbish tip in Orange Grove. By the early 1980's, dedicated club members had spent long hours in nogotiations which resulted in the club obtaining the use of land originally utilised by the now defunct Eastern Hills Motorcycling Club, on the old Northern Road in Chidlow, much of the equipment from Orange Grove was dismantled, relocated and re-commissioned at the new Chidlow facility. 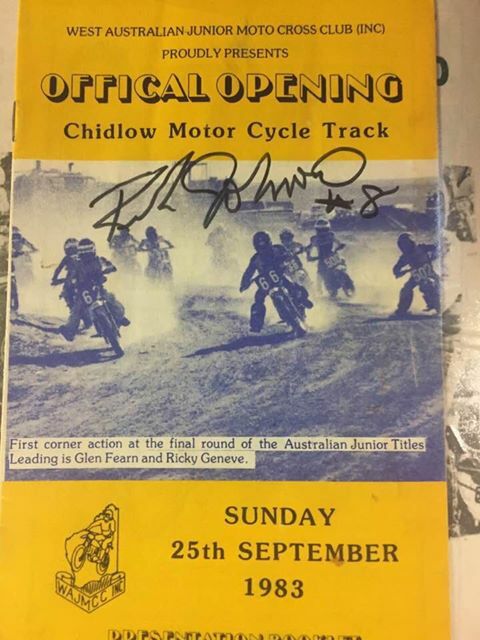 The first meeting at Chidlow was held on the 21st of August, 1983, and the track was officially opened by the minister for Sport and Recreation the Hon KJ Wilson - MLA on Sunday the 25th of September 1983.